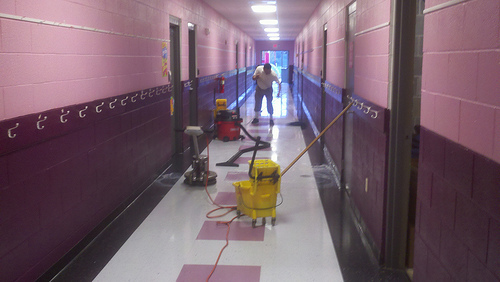 Commercial cleaning companies have high standards to meet. Large cleaning tasks often have to be completed in a short amount of time, and the level of cleanliness reflects the competency and professionalism of the business. Incorporating green cleaning into your business is an increasingly popular practice. By using more environmentally friendly cleaning products, companies can reduce waste, contribute fewer harsh chemicals to the air and water, and create safer environments for people who use the cleaned spaces. Creating a comprehensive green policy is more than using environmentally friendly all-purpose cleaners and hand soaps. Taking green cleaning to the next level means creating a training, maintenance and product purchasing plan that incorporates the tenets of green cleaning into the bigger picture. A well-developed green cleaning policy will lessen your environmental impact and create a safe working environment for your employees. Product selection. Environmentally friendly cleaning products are the backbone of green cleaning. Products that are sourced from natural ingredients, and eschew harsh chemicals and detergents contribute to better indoor air quality, and the reduction of pollution in the water and air. Conventional cleaning chemicals can contribute to skin and respiratory irritation, or burning if improperly administered. By developing purchasing strategies that systematically incorporate green cleaning products, the quality of the spaces and the health of your staff will be directly and positively affected. Training. Going green takes more than just using green products. A solid training program should be developed that instills smart, practical sustainable practices along with the use of green cleaning products. This step is essential to successful green cleaning policy that will have lasting power and be readily adopted by clients and staff. Training your staff to choose the right product for each cleaning job will also reduce wastage, make each cleaning task as effective as it can be, and limit damage to surfaces (a repair cost that your company would likely incur). Sustainable cleaning practices. Creating a green policy can go beyond using green products. Cleaning methods that are more sustainable can also be adopted to form a more comprehensive green cleaning policy. For example, if your company uses conventional cleaning products, consider using ones that come in concentrated liquid form. This reduces the amount of energy it takes to ship them, they require less packaging and you can control the dosage of the chemicals for each cleaning job. Communicate regularly with your staff with regular meetings, a newsletter or a weekly e-mail to keep the green cleaning conversation happening. Regular communication will also increase awareness of green cleaning practices and show your commitment to green cleaning policy.